I’ve been instructing and guiding in the mountains of Scotland since 1970. In 2013 I handed on the business, West Coast Mountain Guides to a good friend and fellow mountain guide, Bruce Poll. At the tender age of 67 years, I needed less hassle in my life! Since then Bruce moved away from Scotland and passed on the reins to Ken Applegate. Ken Lives close to Fort William. So why another web site? I hear you ask! I still climb and work as an ‘occasional‘ mountain instructor/guide, but with much less admin and more time to enjoy the outdoors. Any work that comes my way, will be passed on to Ken Applegate at West Coast Mountain Guides and I may even work on some of his courses from time to time! If you are still unsure, please contact Ken Applegate. I will be using this site and blog to indulge my enthusiasm for photography in the outdoors and various form of activities, from cycle touring, sea paddling and of course, mountaineering. My wife Sue and I have stepped back from running Calluna Self Catering in Fort William. The accommodation business is now in the hands of our eldest daughter, Victoria Kimber, as the managing partner. We can accommodate up to 26 people. 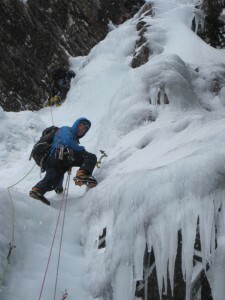 We also rent out climbing gear and we have lecture room on site.